From left to right - Alexandra Pressland - Head of Product, Regi, Selena Hadzibabic - VP of Product, XO Group, Mike Siegel - Senior Product Manager, Splash, Matt Geffken - VP of Product, Jibe, and Emily Tate, US General Manager at Mind the Product; in conversation regarding the topic, "When Reality Sets In: Managing Goals Beyond Q1" at ProductTank NYC at Mixpanel (WeWork). 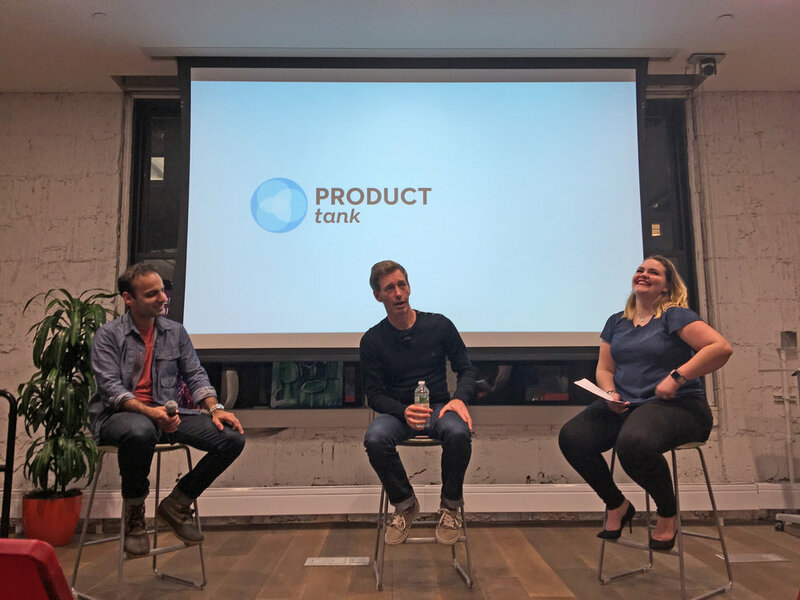 From left to right - Brian Weinstein, Senior Analytics Lead at WeWork, and Matt Wallaert, Chief Behavioral Officer at Clover Health; joined us for "Measuring Actionable Metrics" at ProductTank NYC at Mixpanel (WeWork). Read more on Product Management Insider! 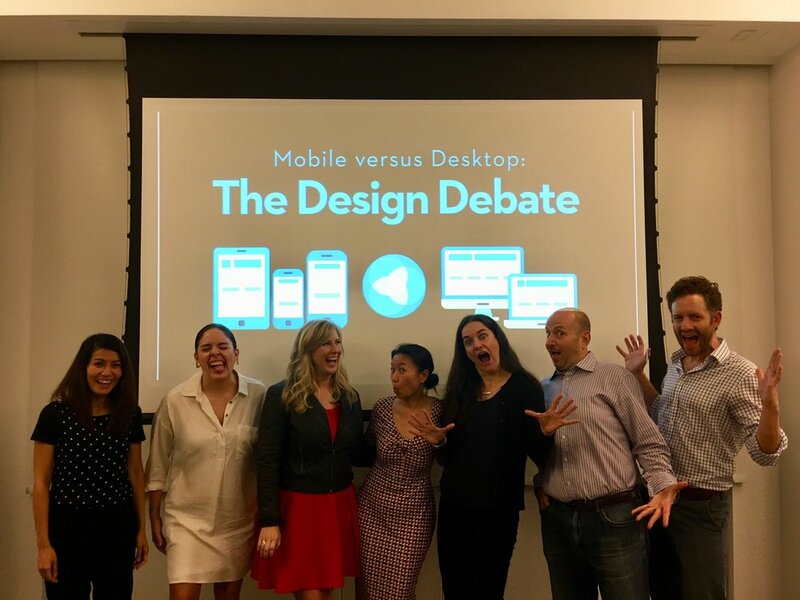 From left to right - Team Mobile: Ringo Lertprecha, Silvia Tueros-Cossio, and Erin Essex; and Team Desktop: Bianka McGovern, Jordan Bergtraum, and Henry Bruce; joined us for "Mobile versus Desktop: The Design Debate" at ProductTank NYC at Shutterstock. Holly Hester-Reilly shared her experience and insights on making product decisions at ProductTank NYC at Capital One Labs. Eric Chambers shared his experience and insights on executing a prioritization process at ProductTank NYC at Capital One Labs. From left to right, John Marcantonio, Shanfan Huang, Jonathan Schwartz and Michelle M. Chu joined us for a panel conversation at ProductTank NYC at MakerBot. From left to right, Jonathan Lai, Alana Mariano, Paul Yokota and Eric Menzie joined us for a panel conversation at ProductTank NYC at Animoto. 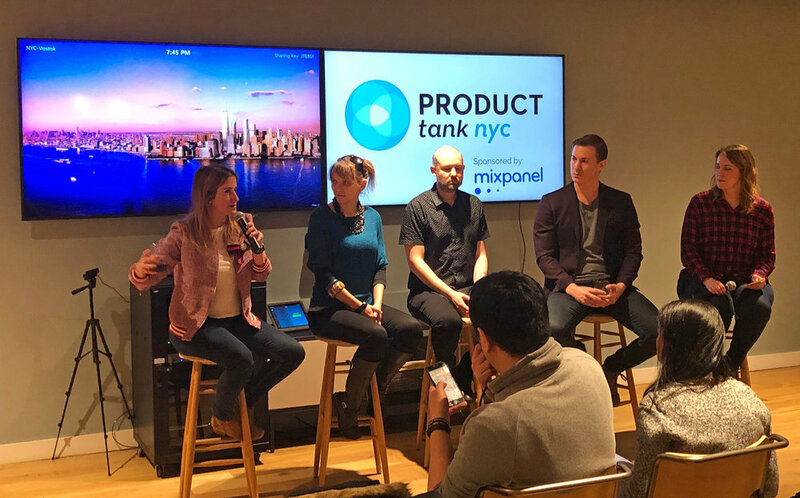 From left to right, Silvia Tueros-Cossio, Michael Clark, Holly Hester-Reilly and John Marcantonio joined us for a panel conversation at ProductTank NYC at Capital One Labs. From left to right, Saad Khatri, Vivek Bedi, Karen Kranack and Tania Philip at ProductTank NYC at Capital One Labs. Watch the recorded webcast on Facebook. From left to right, Tim Miller, Eli Goldberg, Adam Perlis and Jia Liao respond to audience questions during ProductTank NYC at Squarespace. From left to right, Abhishek Mathur, Anne Griffin, and Kenneth Kuo (our guest presenter and Q/A moderator) respond to audience questions during our second ProductTank NYC of 2018 at Metis (at WeWork). From left to right, Saad Khatri, Richard Banfield, and Jessica Waite (our guest moderator) respond to audience questions during our first ProductTank NYC of 2018 at Capital One Labs. From left to right, Erin Essex, Diane Kim, and Clément Delangue respond to audience questions during our 2nd ProductTank NYC event of November 2017 at ustwo Studios. 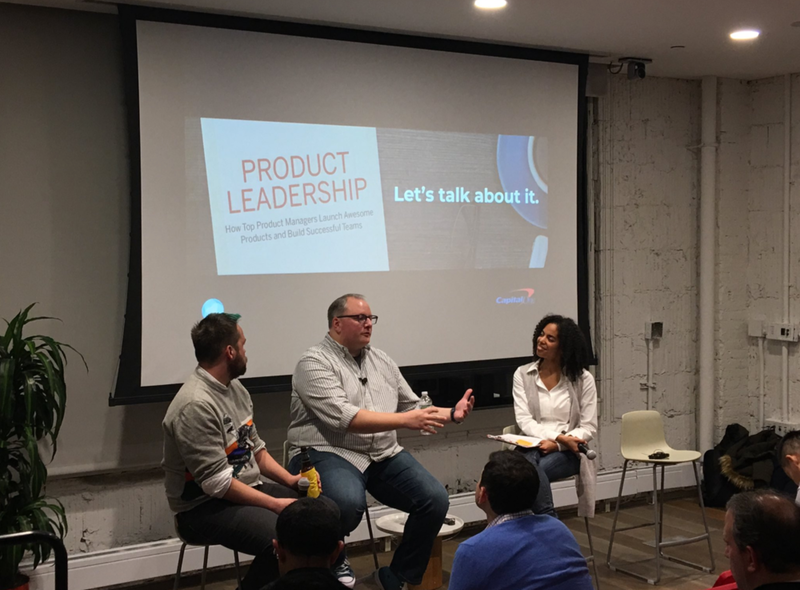 From left to right, George Abbott, Martin Eriksson, and Daniella Patrick (our guest moderator) discuss Product Leadership during our 1st ProductTank NYC event of November 2017 at Capital One Labs. From left to right, Jim Thomson, Michelle M. Chu, and Shiven Ramji respond to audience questions during our September 2017 edition of ProductTank NYC at Venmo. Ellen Chisa has an educational background in engineering and is currently working on her MBA at Harvard Business School. She has worked for companies like Microsoft and Kickstarter, and is currently the VP of Product at Lola. They connect travelers to travel agents for hotels, restaurants, and any other travelling needs. In her ProductTank NYC presentation, she explains the importance of learning and becoming a better product manager. In this ProductTank NYC talk, behavioral designer Nir Eyal examines the ways in which product design can influence consumer behavior, and discusses how to apply this thinking across various technologies to create a positive impact on the world. A full-time job pays the bills. You work with a team of people, customers, and clients, and you do it because you have to, and not necessarily because you want to. A side hustle on the other hand, is a job you do before or after your regular job. Jim Kalbach is a respected author, speaker, and instructor in information architecture and UX strategy and currently Head of Customer Success at online whiteboard business Mural. His latest book, Mapping Experiences (O’Reilly, 2016), focuses on the role of visualizations in strategy and innovation and in this talk from ProductTank New York he discusses the roles and duties related to mapping experiences. Vivek Bedi is the Head of Product at LearnVest. He has over 15 years’ product management experience, working for companies like Goldman Sachs, Sterling Backcheck, and now LearnVest. In his presentation, talks about LearnVest, the role of a product manager, and what he’s learned from his years as a product manager. Alexa Scordato is the VP of marketing at Stack Overflow. Her company is an online community for programmers, and one of the top sites in the world. They see over 45 million visitors per month, seven visits per visitor every month, and each visit lasts about six minutes. The main focus of the site is the Q&A, and there have been over 7.6 billion times that a developer found a solution on their site. Jordan Bergtraum is a management consultant who has been responsible for product strategy, UX, and teams consisting of product and project managers. In his ProductTank NYC presentation, he discusses the challenges of having one person in charge of product and project management. Jordan uses the Tesla automobile as a relatable example. Sophia Huang started her career in the San Francisco Bay Area, and eventually moved to New York City to work with InVision, the makers of the popular InVisionApp software. In her ProductTank NYC presentation, she goes over the challenges of onboarding as a product manager. Daniella Patrick is an Innovation Lab Product Manager at Accenture, which is one of the largest global consulting firms in the world, with clients and partners like Microsoft, GE, HP, and IBM. Accenture now has over 400k people employed, and offices in over 200 cities across 55 countries. Daniella’s educational background is in mechanical engineering and mathematics, and her professional experience includes operations, engineering, and design roles at several startups. In her ProductTank NYC presentation, she discusses her team’s role at their company and how they go about identifying problems and developing solutions. Jenine has the consulting insights to connect business goals with user desire and motivation for service design and application development. She is experienced with the creative and technical skills to design solutions for intuitive, enjoyable experiences in a complex digital environment. Adrian Franks is a design director and creative strategist at IBM. At IBM he worked to design and develop the Creative Toolbox, which helps designers and product managers familiarize themselves with the various tools available to prototype and create new products. Jason Fleitz is Director of Web Operations at LivePerson, where they develop products such as LiveEngage- a platform that gives companies the ability to engage with their customers anytime on web sites, mobile and social networks. In this presentation at ProductTank NYC, he explains about how designers and developers can work better together on software projects, by adopting some simple tactics and strategies for better collaboration. Paul Yokota talks to ProductTank NYC about the process of launching products and discusses the many associated challenges, reflecting on the challenges he faced when launching Animoto’s Marketing Video Builder app.